It’s been a year since Sophie’s mother Donna (Meryl Streep, who starred in the first film and shows up here in a brief scene) has passed away. 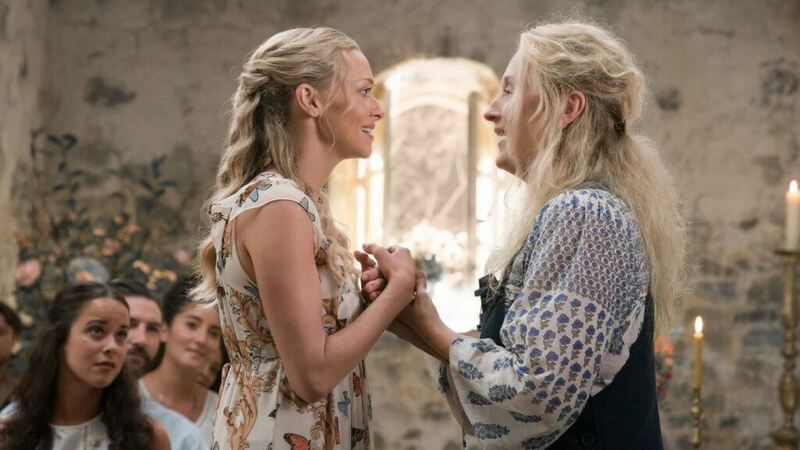 Sophie (Amanda Seyfried) is busy preparing for a big party celebrating the opening of a small hotel on the Greek Island that she and her mom called home. She invites her three fathers to the shindig and if you missed the 2008 film, her mom had 3 affairs in a short period of time and was never positive which young man was the father. Pierce Brosnan, Colin Firth and Stellan Skarsgard play the men, who have accepted that they all share a special part of Sophie’s life. The story cuts back and forth to 1979 where Donna (starring Lily James – 2015 Cinderella and Downton Abbey) is a recent graduate moving to the island to the present day, where her daughter Sophie is dealing with the upcoming party, a boyfriend who has accepted a job in the states and a big storm that’s about to hit the island. The story is of course, is all about Abba’s terrific music. There’s a big production number with Donna’s graduating class singing and dancing to “When I Kissed The Teacher” that is over-the-top and fun, a terrific “Dancing Queen” number and what I was waiting for, the dramatic ending when Cher appears as Sophie’s grandmother to sing “Fernando” with Andy Garcia. Lily James is great as the young Donna, she’s exuberant, very expressive and has a smile that lights up the room. Both she and Seyfried have good voices and can sell a song. Writer, director Ol Parker has a lot of star power here (Christine Baranski and Julie Walters also star as Donna’s singing group) and he manages to corral it all into a really entertaining sequel. MPAA Rating: Rated PG-13 for some suggestive material.